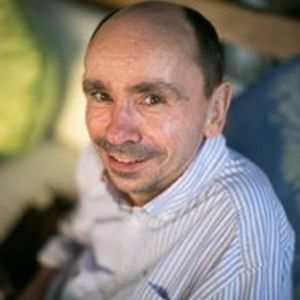 Hi, I’m Dom and I’m a chocolate maker in London. 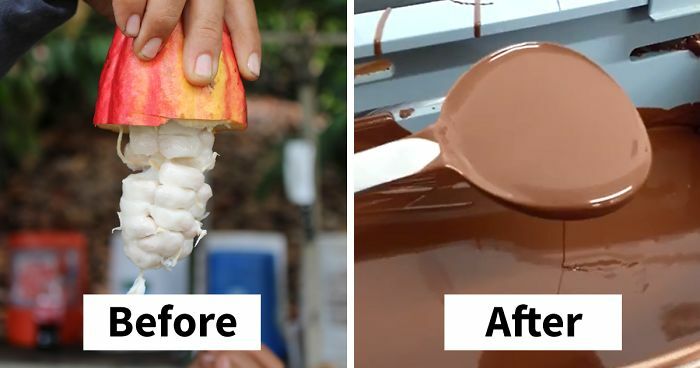 Here’s a breakdown of how craft chocolate is made from tree to bar. Nearly all the chocolate in the world is manufactured in huge industrial factories by 4 or 5 large companies, but there is a growing movement of ‘craft chocolate’, where passionate chocolate lovers produce chocolate from ‘bean to bar’ from scratch. This is what we do, and this is how we do it! 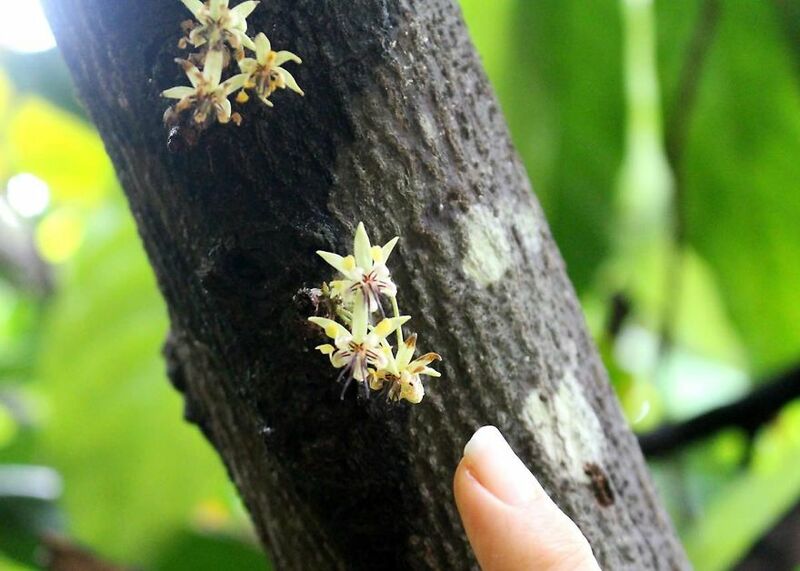 It grows directly from the trunk and large branches of the cocoa tree (Theobroma Cacao), and develops into brightly coloured cocoa pods. 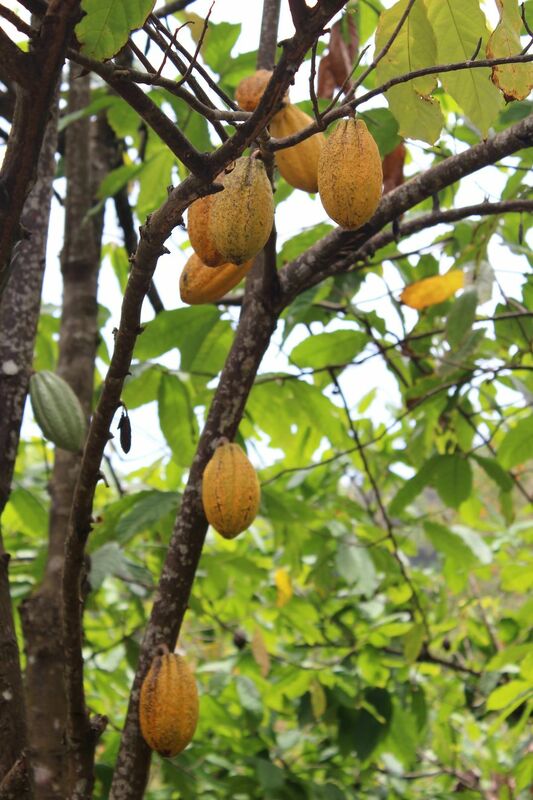 This picture was taken in Hawaii, the only place in the US where cocoa can be grown. 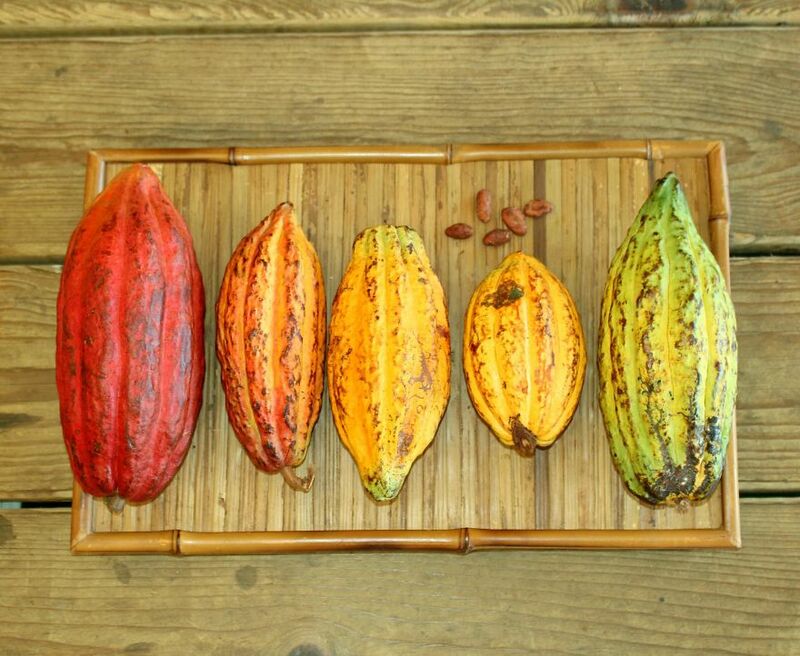 The colour differences are down to variety and minor genetic differences in the cocoa. Different varieties are different colours. Most have a purple colour like this, while some finer flavour beans are almost white. These are transferred to some kind of container – usually a large wooden crate, and covered in banana leaves. They are then left to ferment for 5-7 days. This fermentation process is crucial to the flavour development of chocolate. During the process, beans can exceed temperatures of over 50C (120F), so if you’ve ever eaten a product labelled as ‘raw chocolate’, it’s almost certainly not raw. In some parts of the world (such as here in Grenada), the beans are turned by walking through them shuffling the feet in a process known as tramping the beans. Alternatively, if you don’t want foot-turned beans a tool called a rabot can be used! People like me! This is how we receive the beans. As you can see, a lot has already gone into production before we get our hands on the beans, so we try to have a direct contact with the farmers and co-operatives, both so we can ensure they get a fair price (we pay around five times the Fair Trade price), and can also give feedback on quality. Most of the industrially made confectionery around the world is still largely untraceable thanks to being traded through many middlemen, which is a real problem in the industry. Something we are trying to change. We’re looking for broken beans, twigs, stones and any other debris that may be left over from the fermentation and drying processes. We only want the best beans for our chocolate. This is our little roaster! 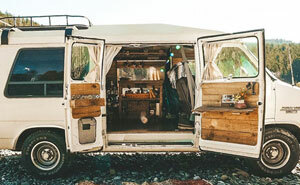 Yes, it’s a converted oven. The beans sit in the drum which rotates while we roast the beans for around 20 minutes. There isn’t a whole lot of professional equipment available for small scale chocolate makers, so we have to improvise! The top part is a juicer which we use to break the cocoa beans. Underneath, the winnower is attached to a vacuum which pulls away the lighter, papery shells that cover each bean. We put roasted cocoa beans in the top and we get cocoa nibs in the bucket! More freshly winnowed cocoa nibs, ready for grinding! As the drum turns, the nibs get crushed. Friction from the process generates heat which melts the cocoa butter in the nibs. About 50% of the weight of a cocoa bean is cocoa butter which melts at around body temperature. At this stage we add cane sugar (30% by weight for a 70% dark chocolate), and any milk powder (milk chocolates) and flavourings we want. The chocolate stays in the melanger for 3 days. All the time the particle size is being reduced, making the chocolate smoother and smoother. But it also develops flavour in a process called conching. The constant movement and heat drive off any bitterness and develop the natural flavour notes in the chocolate. Every origin has a unique and distinctive flavour. After 3 days, it’s time to pour the chocolate out! The whole machine tips up and we transfer it into large plastic tubs, then let it set. 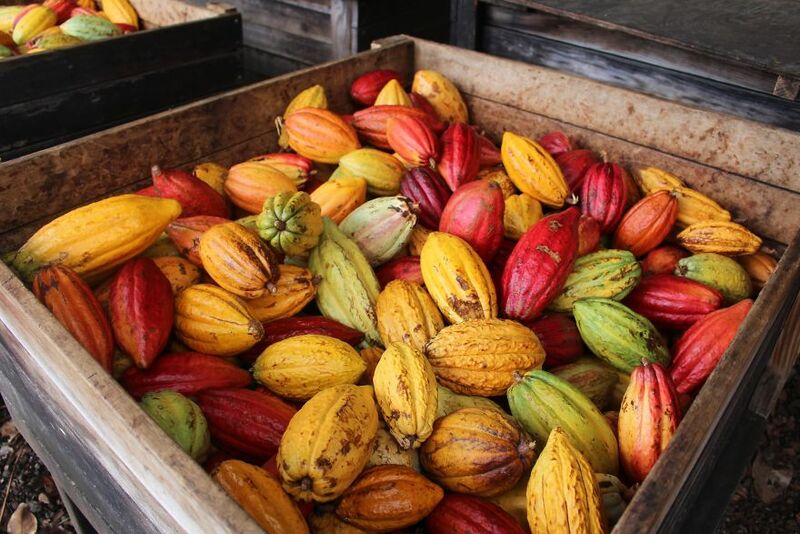 We age the chocolate for several weeks, which helps to develop the flavour further. Chocolate exists in several different crystal forms and tempering makes sure we just get the right form for a nice shiny bar. This is done by raising and lowering the temperature very precisely. Luckily we have a machine that does that and beeps at us when it’s time to mould the bars. We ladle the chocolate into polycarbonate moulds, vibrate them to remove any air bubbles, then let them set in the fridge for a couple of hours. If properly tempered, the bars will easily release from the moulds when set. We do, however, sell to chefs, hotels and restaurants so their chocolatiers can use our chocolate to produce their confections. We like to use these resealable pouches for packaging as you don’t tend to eat a whole bar in one go. This way you can break a piece off and put it back in your bag without making a mess. Panorama of our workshop. It’s small but has everything we need! The front of my shop & workshop in Islington, North London. You are welcome to visit and try some, of course! Did anyone else just get hungry? Finished reading with a watery mouth! DAMson thats some nice chocolate!